EXAGEN is a preventative aid in the control of cryptosporidial scours. How is EXAGEN different from KRYPTADE? EXAGEN is not an electrolyte. It is a mixture of beta-cyclodextrin and prebiotic/ soluble dietary fibre. Beta-cyclodextrin acts to knock out oocysts, and reduce the severity of infection before the calf starts scouring. Can it be used for rehydration then? It can be added to an isotonic electrolyte such as ENERVADE to provide a simple rehydration solution. There will be differences from KRYPTADE, as KRYPTADE is formulated with additional features, one of which is the addition of seaweed extract to improve palatability. KRYPTADE also has additional amino-acids targeting the requirements for gut recovery. How then is EXAGEN used? EXAGEN is simple to mix into milk or milk replacers (and even colostrum). Calf body weight can vary so one dose fits all calves. How often should EXAGEN be given and for how long? To maintain its activity of the knockout of oocysts, twice daily administration is required. This prevents oocysts from re-infecting the host by 70% in mouse experimental studies. The same daily dose of 25 g split three x daily i.e 8 g prevented re-infection by 99.4%. In calves 25g once daily reduced oocyst output with a reduction of the contamination of the calf shed, and the severity of scours. For reducing infection rates 2 x or 3 x daily treatments are recommended, especially in the first 3-5 days of life. 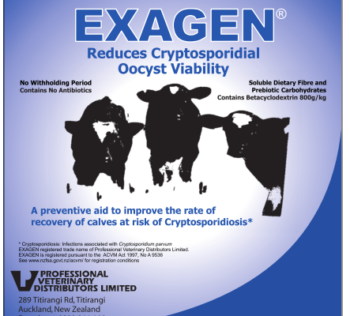 Once daily use of EXAGEN will enable any scours to respond more quickly, though there may be some calves which become depressed with loss of appetite for a short period (unpublished trials). The period of use should be for a minimum of 3 days starting at any age, as soon as the calf is being fed milk away from its mother until past the time when calves are commonly affected with crypto scours e.g. 12 days or longer. What are the benefits of EXAGEN? With twice daily treatment calves maintain their appetite for milk, do not become depressed and any scours is substantially reduced. This simplifies the management of calves and reduces the work of calf rearers. Calf rearing becomes manageable without hospital mobs. A reduction of the numbers of calves developing scours should also be observed, though this is difficult to measure. Marking scouring calves when calves start to scour, and recording the period over which scours is observed is recommended. 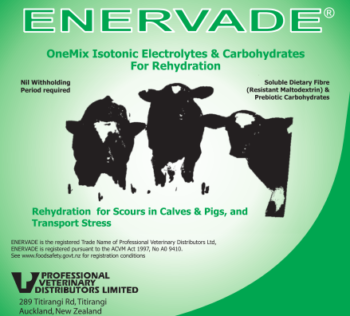 What is used as an electrolyte for any calves scouring? Either KRYPTADE or ENERVADE can be used. KRYPTADE may be useful if the calf is not consuming full meals of milk. Separate the availability of KRYPTADE from milk feeding by 3 hours. These electrolytes though can be made available for calves ad lib (such as overnight, so they the calves will determine whether they prefer electrolytes over water. It is important to ensure water is available at all times as well. Don’t see the answer to your question? Contact us directly for further information. 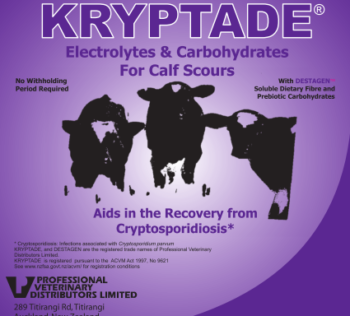 KRYPTADE, ENERVADE and EXAGEN are the registered trade names of Professional Veterinary Distributors Limited. KRYPTADE, ENERVADE and EXAGEN are registered pursuant to the ACVM Act 1997, No A9621, A9410 and A9536. 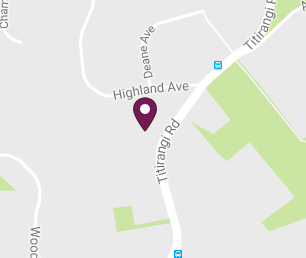 See www.foodsafety.org.nz for registration conditions.